That is a grammatically correct English sentence. Now, I’m pretty good at this English grammar thing, but it took me quite a while to understand exactly how this series of buffaloes could possibly express a genuine grammatical thought. But eventually I figured it out. And now I’m here to help you. Read on — this is sure to make you a hit at parties. 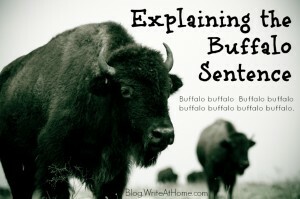 First, understand the different uses of the word buffalo. Of course it’s a noun. That’s the most obvious. It’s the big animal once hunted by plains Indians. Be aware that there are two acceptable plural forms of buffalo: buffaloes and buffalo. All the noun uses in this sentence are plural. Buffalo is also the name of a city in New York. A dentist from that city might be referred to as a Buffalo dentist. And, of course, a buffalo from Buffalo would be known as a Buffalo buffalo. That’s a key piece of this puzzle. Notice that this use of buffalo requires capitalization. To buffalo means to overawe or intimidate. A pushy salesman might buffalo you into buying encyclopedias you don’t really need. Get it now? Okay, maybe not. Let’s try breaking it down into grammatical parts. First, every time you see the capitalized Buffalo, it’s an adjective modifying the ensuing noun. Three times this sentence refers to Buffalo buffalo, which means a buffalo from Buffalo. The next buffalo is the simple predicate or main verb. It’s what the original Buffalo buffalo do. They buffalo. The final Buffalo buffalo pairing is the direct object of the word buffalo. It’s what the Buffalo buffalo buffalo. They buffalo Buffalo buffalo. If you are still lost, don’t worry. It will all make sense here. I just thought I’d drag it out a bit. Here’s what the sentence is saying, replacing the verb buffalo with the verb bamboozle and adding several other clarifying words. Buffalo from Buffalo that other buffalo from Buffalo bamboozle, bamboozle still other buffalo from Buffalo. It’s a nonsense sentence of course. No one is suggesting that it is a reasonable statement. Just that it is grammatically sound. Buffalo buffalo that other Buffalo buffalo bamboozle, bamboozle other Buffalo buffalo. Buffalo buffalo Buffalo buffalo bamboozle, bamboozle Buffalo buffalo. Finally, replace bamboozle with the verb buffalo. Buffalo buffalo Buffalo buffalo buffalo, buffalo Buffalo buffalo. The comma helps and should probably be inserted all the time, but that just makes it too easy! Alaskan people Alaskan people love, love Alaskan people. That’s the best I can do. I hope somewhere in this discussion it came into focus for you! Make a blogger’s day. Leave a comment in the Reply section below. Question from a Reader: Is “However” a Filler Word? Just came across this blog. We have a similar one in the Chinese dialect of Hokkien which goes like this “Gong Gong Gong gong gong gong Gong Gong Gong”. Still trying to figure it out! LOL! I may put it on my subject and predicate quiz tomorrow for extra credit! LOL! The fact that I got it somewhere in the middle, just goes to show how well you explain things, Brian! Always look forward to your posts, and they even make me slightly wish I were teaching writing again 🙂 Hope everyone is doing well!! My wife’s from Buffalo, so I was determined to understand that sentence. “James, while John had had “had,” had had “had had”; “had had” had had a better effect on the teacher. Wow! That was some Rosetta Stone quality code cracking there! Sending this to all my word pals. This will be part of next week’s lesson for my English I class!! Fun! !